Ever since the introduction of Xenon or High Intensity Discharge (HID) lights in the early ’90s on the BMW 7 Series, and Light Emitting Diode (LED) lights in cars such as the 2006 Audi R8, the brightness and intensity of headlamps has increased. That’s good news for drivers of cars fitted with these powerful lights: seeing further down the road reduces the chance of accidents and driver fatigue. But if drivers forget to dip their lights, it can temporarily blind oncoming traffic. “Ask any driver what the most annoying habits of other drivers are and sooner or later the subject of people who don’t dip their headlights will come up,” says Michael Koherr, a research engineer for Ford who specialises in vehicle lighting. According to the most recent government figures, dazzling headlamps do cause accidents and even deaths. Police record the contributing factors of accidents in Britain. One of those is ‘dazzling headlamps’. In 2014, police who attended the scene of the accident reported this as an influence in 10 fatal crashes, nearly 70 serious accidents and over 250 slight accidents. But some campaigners point out that minor accidents, which often aren’t attended by the police, but can be distressing for drivers and may result in insurance claims, go unrecorded. The problem has been under the spotlight for decades. And Michael Koherr says it’s not just drivers being dazzled that is the problem. Some motorists don’t switch to high-beam when the road ahead is clear, which can be especially dangerous on unlit, rural roads. Now, however, drivers needn’t lift a finger. 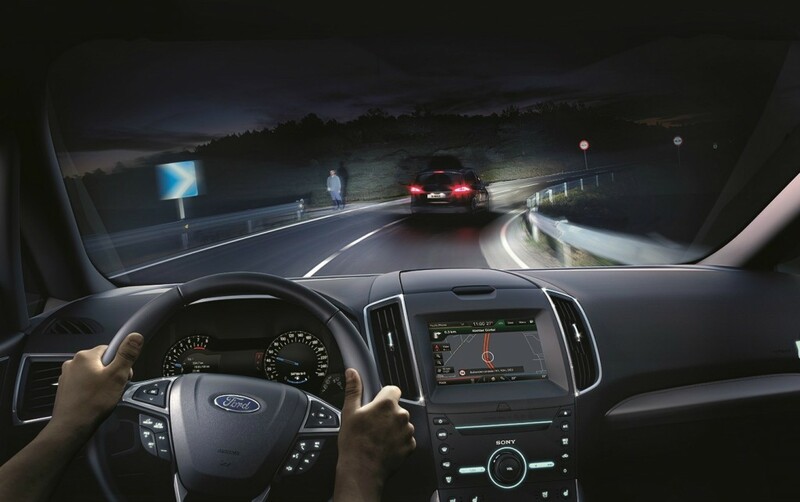 Technology has allowed engineers at Ford to develop new systems that effectively take over the operation of the lights for the driver, and even adapt the light pattern of the headlamps according to driving conditions, traffic and obstacles such as pedestrians or cyclists. Called Glare-Free Highbeam, the system was developed at Ford’s European research centre in Aachen, Germany, and can be fitted to cars drivers can buy today – including the Mondeo, S-Max and Galaxy family cars – for £900. It is a sign that the once exclusive technology is filtering into everyday cars. How do glare-free headlamps work? Ford says its Glare-Free Highbeam works with other lighting systems to adjust the headlight beam angle and intensity to one of seven settings according to speed, ambient light, steering angle, distance to the vehicle in front and windscreen wiper activation. You get a better picture of how it works in practice in the video, below. Ford believes such smart lights will eventually become a standard feature on all its cars. “Like all new technologies, it starts at the most expensive end of the market with the margin to invest in the tech. Then the price comes down per unit and smaller cars can tap into it in the future,” a spokesman revealed. The car maker is not alone in developing intelligent headlight systems that can adapt the spread of light according to what sensors fitted to the vehicle see on the road ahead. Audi, BMW and Mercedes have offered so-called smart lights as a cost option on many of their popular models – not just expensive, flagship cars. Having tried a number of different makers’ system on the road, it’s impressive to find how seamless the technology has become. Audi’s system will even integrate with sat nav to anticipate the road ahead. So next time you order a new car, or buy a relatively young used car, sing along to Blinded By The Light for all the right reasons, and consider choosing glare-free adaptive headlamps. Hid led and xenon lights are all way to bright. I dont see why you need lighthouse grade bulbs for the road. The irony is that your excuse for them is to be seen…. yet your lights are so bright we can not see you because you are blinding us. They all dazzle and blind and are just plain stupid and irresponsible. Fashion/ fad/ weapons??!!! but remember this….when you blind oncoming traffic its you that will be the cause of your own head on collision. These very bright lights should be banned, they are unnecessary and dangerous to oncoming drivers.